Kudos to Ski Trab for an innovative toe piece! With a patented design that doesn’t require coiled springs, the Gara Titan approaches the 100 gram weight barrier that only recently seemed implausible. With the toe lever angled against included striker plates, the pins are pressed into the boot for a locked position. There is of course an unlocked ski mode to comply with ISMF rules, with the release based on an ultra-reliable titanium wire-spring. As with “traditional” race toes, pressing down on the Easy Lever allows the wings to open for exit. The heel is the same proven design used in the TR-Race model. 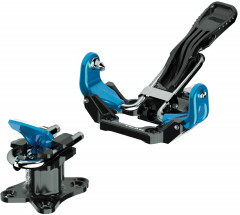 The bindings come with either steel or titanium U-springs; the latter version is officially named Gara Titan World Cup. Patented toe piece weighs just 66g (2.3 oz) with both locked & ski modes. Design is less susceptible to pre-release caused by improper closure due to ice build-up. Heel piece has a pin-cover flap for basic skinning and rotates for flat-on-ski position. Toe pins have grooves to help clear boot inserts of ice and dirt during rotation. Included removable crampon attachments (+4g) accepts all Dynafit-style ski crampons. Included leash loops (+2g) provide convenient attachment points. Update 2016/17: Trab has introduced a version with a thinner heel spring (4.5mm vs 5.0mm) for lighter skiers. Also the toe piece has been redesigned slightly to better accommodate certain carbon race boots. Update 2017/18: Trab added an even thinner spring (4.0mm) for the lightest skiers. Update 2018/19: Ski Trab anodized the bindings with Skimo Blue! The build remains the same. Notes Next gen toes without coiled springs. Bottom Line Crazy light, strong, and simple. between gara titan and titan vario, cant really see the difference other than a few grams in weigth. Could you give some light here! and between these two and the Dynafits? Hi Salvador, the Vario version has a different lateral spring mechanism in the heel which adds a lot of elasticity. It's a bit better in terms of release and retention when skiing unlocked. It also has a wider heel gap which can help with flat-on-ski skinning. Send us an e-mail if you'd like to discuss some specific Dynafit models (which vary greatly)! Does the Gara Titan toe use the same 30x27mm mounting pattern as the other Trab bindings?? Thanks! Hey Robert! 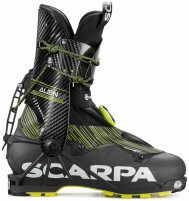 Yeah, same toe pattern between the TR-Race and Gara Titan bindings! Similar hole pattern to the Kreuzspitze, Plum, Hagan/ATK/Black Diamond/and some of the older Dynafit bindings. What is the heel spring length (4.0, 4.5, or 5.0 mm)? I don't know which one to select. Hi Mark, all the springs are the same length. The measurement is the thickness of the spring, which varies the forward release value (roughly R8, R10, R12). How well does the flat mode work, when compared to something like the Hagan? It looks like they're both mounted at a 4mm spacing, and both have very minimal plastic (i.e. almost none) sticking out beyond the horseshoe, so is the flat mode performance identical? Hi Brian, yes the flat mode is about the same as the Hagan ZRs. It works better with the Release version of the binding which uses a larger heel gap. Me: 5'10", 160lbs, type III skier. I have these mounted on my 177cm Movement Response-X, and ski them with green TLT6Ps. These are my first real race bindings, having been on the progression towards truly light gear for some time now. They're awesome. The toe is different from normal Dynafit-style toes in that it defaults to closed, you apply pressure to open it but it closes as soon as you release the pressure - there is no "locked open" mode like with most other tech toes. In practice this means you press down on the toe lever with a ski pole while entering the binding. On any sort of flat ground this is intuitive and straightforward. Like with any brakeless setup, this can be a somewhat riskier proposition on a sharp ridge or standing in a steep couloir. I have found that I am able to use my thumb to open the lever while I hold the ski in my hand in these situations, and I anyway haven't managed to have a ski run away yet! I am 100% satisfied with this binding, it has everything I want (flat mode, low riser, the ability to go from uphill > downhill without rotating the heel piece) and nothing I don't feel I need (high risers, adjustable RV, brakes, etc). They also don't have a funky ramp angle or anything, even with the adjustment plate I stand very flat on the skis. I'm a race binding convert after owning these... I'm curious to try some of the lighter race bindings with "normal" toes but I absolutely would not hesitate to buy these again. Do you know if the steel version has a higher release value than the titanium one? I'm wondering if the steel would be more on par with the Hagan/ATK heel? Hi John, the RV is approximately the same on those. Like some other manufacturers, Trab shortens the U-spring in the titanium version to compensate for its lower Young's modulus. Highest RV is actually found in the Release version, which is on par with the Hagan. Note softer springs will be available later this season for both versions. How does this binding stack up to the Hagan ZR in the ~100g category for potential use in a non-racing ultralight touring setup? The biggest difference between the Trab and the Hagan is the Trab toe works opposite to every other toe piece on the market. you push down on the lever to enter and the spring default is closed (with other bindings you push down on the lever and it stays open until you step in). Otherwise the binding makes a great ultralight touring binding. It has a decent flat mode and it's easy to turn heel piece. The only other consideration is this has a slightly lower release value than the Hagan. So depending on what setting you like to have while skiing, you might pick one over the other. You may also consider the Release version of this binding for touring which adds more heel elasticity at minimal weight. I have used this binding for only a week now so I can't speak to the longevity of the product. Having used ultralight race bindings for descent oriented ski touring for the past four years, I can say that these certainly feel the most robust of the lot. The heel cover is sturdy. The heel piece rotates smoothly into the flat touring mode without undue force. I quickly became accustomed to the toe piece's requirement for active pressure when engaging the boot. One can use one's hand or the tip of a ski pole and it has not proven to be a factor with regard to time during transitions. I have yet to utilize the locked position of the toe piece while skinning uphill or skiing downhill which suggests that releasing from the bindings is going to be unlikely when I fall. One must remember that this is a minimalist's binding as it has no heel riser, brake, or reliable release. For people that are primarily focused on weight while ascending and are potentially interested in a binding that allows big turns while descending, this Trab binding has proven to be a great option thus far.